As part of an ongoing effort to portray public schools as underfunded, the impact of the devastating Lost Decade on taxpayers is being overlooked as spending advocates point to budget cuts made 15 years ago. With Michigan approaching the 10th anniversary of its worst days of the nationwide Great Recession – a state unemployment rate of 14.6 percent in June 2009 – memories of the devastating one-state recession that preceded it in the early 2000s are fading. At the same time, proponents of increased public school spending have changed their talking points. Beginning around 2013, politicians, public school administrators and teachers unions began to claim that public school funding had been cut during the term of former-Gov. Rick Snyder, who took office in 2011. The truth, however, is that starting in 2013, state funding for Michigan’s public K-12 schools (not including local or federal revenues) has increased by nearly $1 billion, even after adjusting for inflation. It rose from $10.8 billion in 2010-11 (the equivalent of $12.16 billion in 2018 dollars) to $13.04 billion in 2018-19. School spending interests no longer focus on current or recent fiscal conditions. Instead, they are pointing to school budget cuts made 15 years ago. Backed by a recent study from Michigan State University, spending interests describe K-12 school funding as having declined since 2003. To do so, they skip over a simple and obvious fact: The period from 2003 through 2018 includes two very different episodes in state economic history, the first, a time of sharp decline and the second, one of gradual recovery. That strong economy began winding down after the dot-com market crash of 2000. Beginning in 2004, state budgets also went into decline in inflation-adjusted terms. As a result, Michigan school aid budgets were stagnant and even in decline from 2004 through 2012. Budgets recovered starting in 2013, but after adjusting for inflation, school funding is down for the entire period from 2003 to 2018. To sum up the historical record, school spending rose sharply during the go-go years from 1994 to 2002, was flat-to-lower from 2003 to 2012, and has gradually risen since then. What all these raw numbers fail to show is the devastating impact the one-state recession, which began in the early 2000s, had on Michigan workers, homeowners and taxpayers. Michigan lost 805,000 jobs from 2000 to 2009. 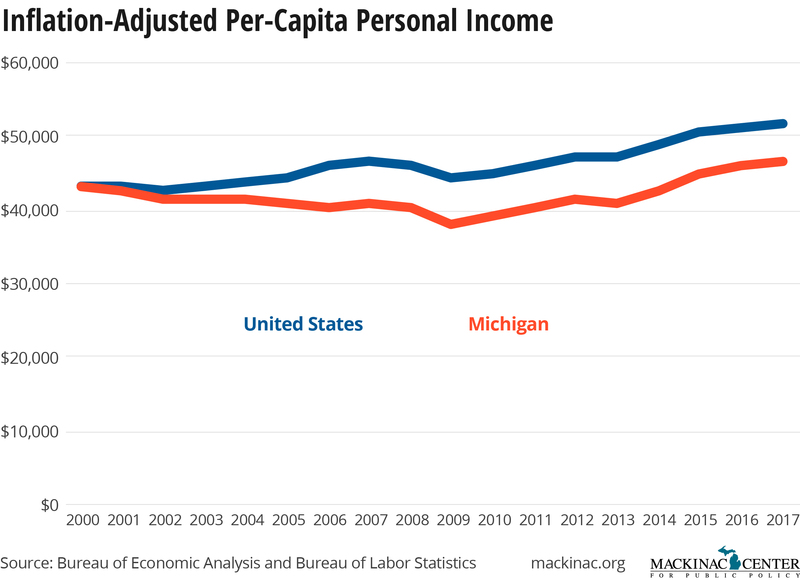 Not surprisingly, the per-capita personal income of Michigan residents tumbled, falling from the nation’s 18th-highest in 2000 to 38th place in 2009. (The actual numbers were $30,310 in 2000, which was equivalent to $37,913 when stated in 2009 inflation-adjusted dollars, and $33,938 in 2009.) That decline was the fourth-largest for any state in the country during any nine-year period going back to 1929. The relative decline in school funding, then, came during what some observers called the Lost Decade, when Michigan taxpayers were suffering economically.